First, I just need to get it out there, I am so excited about my photos for this post! Ok, enough back patting for one blog post. 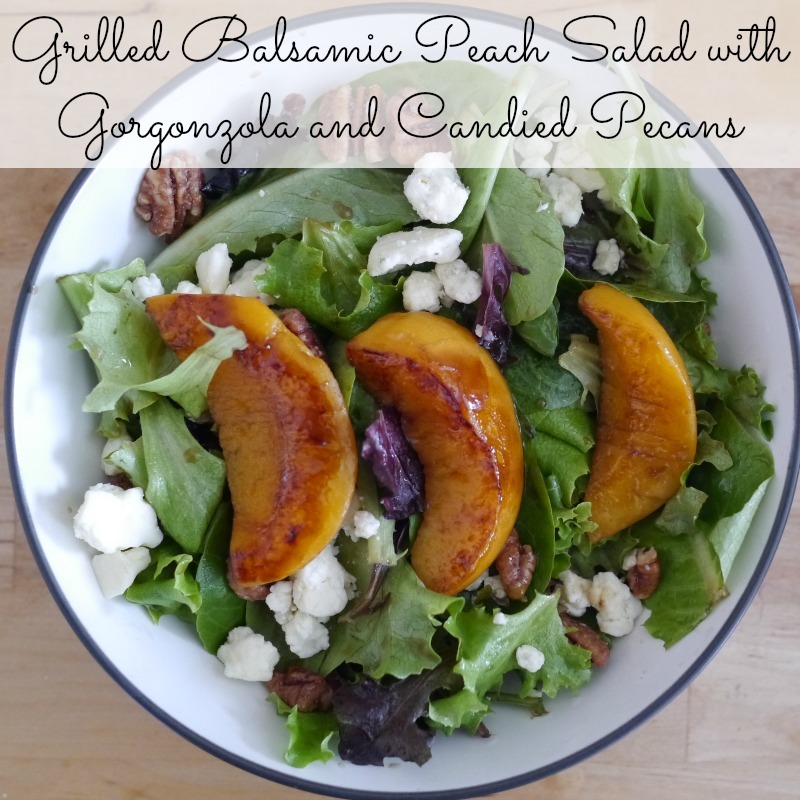 A few weeks ago I went to California Pizza Kitchen for lunch and had the tastiest salad with grilled peaches. Who would have thought to grill peaches? Plus it was a wonderful mental escape from the 20-degree Boston weather (I know all of you folks out there who live in warmer climates are jealous!) since I associate peaches with summer. I loved it so much, and because I am always looking for way to eat my daily greens in way that is more interesting than simply tossing in some tomato wedges and cucumber slices (which is not only boring, but it usually induces me to turn instead to a much less healthy food choice, usually involving some sort of processed carbohydrate), I decided to come up with my own version of the salad. What’s your favorite way to get your daily dose of greens? Wow! That looks yummy! I’m totally making it this week, but I will sub feta for the gorganzola. I am NOT a blue cheese fan! I do love cheese as well (and makes salad-eating that much more enticing!) Thanks for stopping by, Andrea. And my grill ran out of propane Sunday. Crap. This looks so good…all favorite ingredients of mine:) Will have to try sometime soon! Hi Bev! I’m stopping in from Let’s Get Real today. It is so nice to meet you. This salad does look fantastic. I’m a big peach fan and like you……….I think of them as a summer fruit. Time to change my attitude! I bet grilling would give them wonderful flavor. The colors of this salad are great. Hi Bev – Oh, this looks delicious! I live in a big peach-growing state, so I will definitely keep this in mind for summer. Thanks for linking up with the Let’s Get Real party. Ooh, you must eat a lot of delicious peaches! I miss them this time of year and looking forward to eating them soon. Thanks for stopping by!